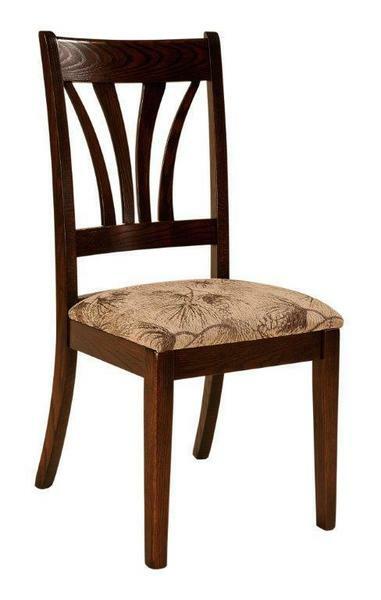 The Amish McCohen Dining Chair is a terrific transitional style. Blending the contemporary with the traditional, the McCohen offers maximum comfort along with contemporary shapes. Artwork within the chair back is evident, with a fan design made of bent and sculpted wooden slats. A raised lower chair rail and wide chair crown add to the exquisite form of the McCohen. One trait of transitional style you'll love is that it adapts to changes in decor and will remain a style that will always work in your dining room or kitchen. Be sure to view the McCohen in a swivel bar stool option or stationary bar stool option. These wood dining chairs are Amish made in northern Indiana and are completely customizable. Choose from nine wood species along with the stain you like best. We offer rustic woods for a natural and rugged look, and they come with either open or filled knots. If you prefer an upholstered dining room chair, we offer a wide variety of custom fabrics with all the colors and patterns you're looking for.